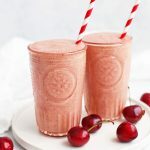 BANANA – I know not everyone likes bananas in their smoothies, but I put 1/2 a ripe banana in this cherry smoothie recipe. It lends creaminess, a tiny bit of sweetness, and doesn’t overpower the cherry flavor to my taste buds. If you don’t like bananas, you can use some yogurt (plain or vanilla) instead. It’ll change the flavor slightly, but will help you keep the texture creamy similar. YOUR FAVORITE MILK – I use unsweetened almond milk or cashew milk most often. Both pair nicely with the cherries. You can absolutely use whatever you’re drinking–dairy milk, rice milk, soy milk, etc. 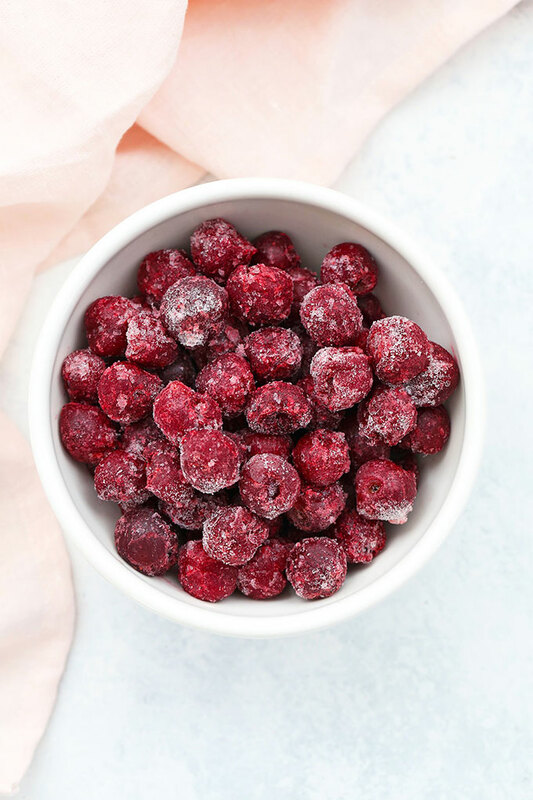 A LITTLE FLAVOR – I use a combination of a few drops of vanilla extract plus a few drops of almond extract to bring out the cherry flavor even more. I miss them if I leave them out, so I don’t recommend skipping them unless you must. ANY FAVORITE BOOSTS OR ADD-INS. 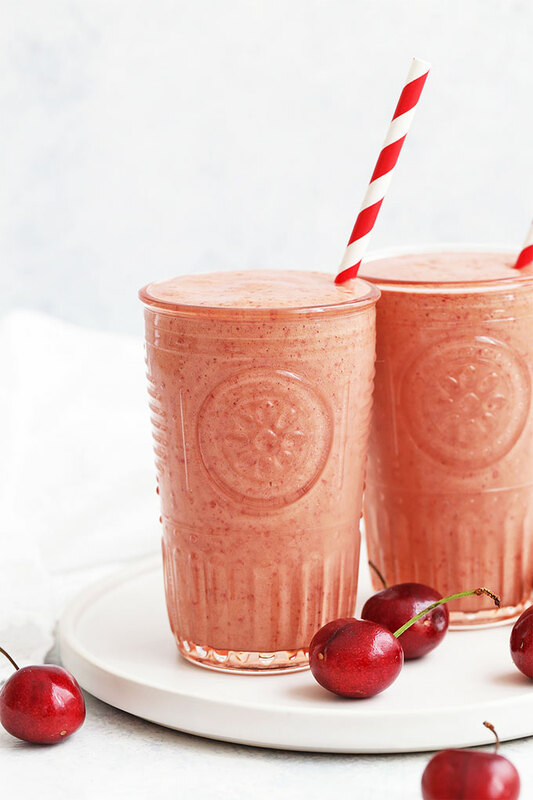 This cherry vanilla smoothie is a great home base for lots of add ins and boosts. See below for some of my favorites! Collagen or Protein Powder – Collagen is my go-to protein option, and I highly recommend it here if it fits your diet. It’s not gritty, and it’s virtually flavorless, so it blends right in and give this an extra creamy texture. Note: It’s dairy free, but animal-derived, so it’s paleo approved, but not suitable for vegans. A spoonful of chia or hemp – Prefer a vegan option? A little chia seed (healthy fats!) or hemp hearts (hey, protein!) is a great way to go! Let’s talk blenders. I’ve used a Blendtec for 5 years (I’ve got over 1200 blends and counting!). Mine is refurbished, and it’s been a workhorse in my kitchen. I really like it. That said, you don’t need a high-speed blender for this recipe. You can even make it in a food processor if you need to (you just might need a tiny bit of extra liquid to help it blend). Tart or Sweet cherries? 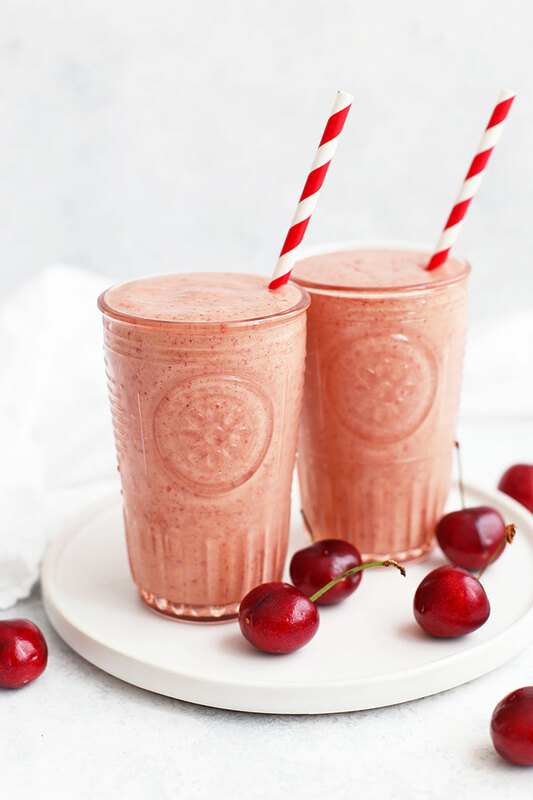 I mentioned this above, but in case you missed it, you can use either tart or sweet cherries in your cherry smoothie. Both are delicious. 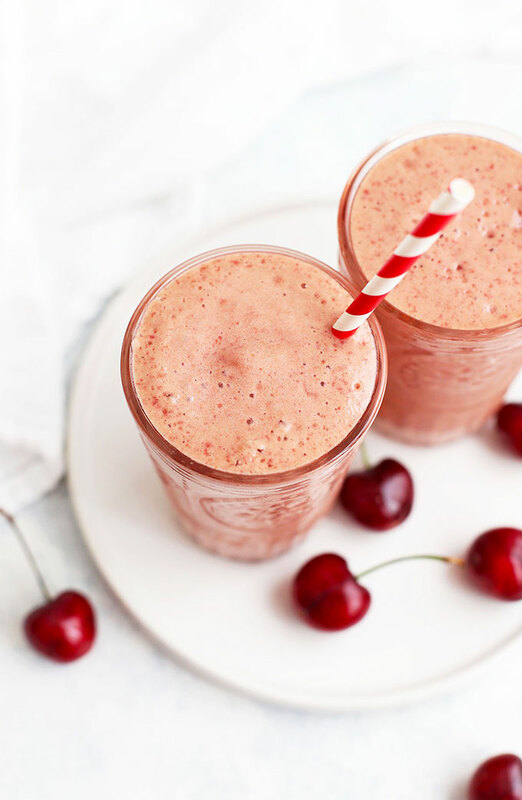 Depending on your sweet tooth and the tartness of your cherries, you may find you want to add a small drizzle of maple syrup or honey to your smoothie to offset any sourness you run into. Puree until completely smooth, adding more almond milk as necessary. « (Free!) Printable Valentine: You’re all Write! When you add spinach, do you pack the one cup tightly, or is it a loose one cup? I hope you can find them! I get mine at Sprouts or Costco most of the time! I’ve also seen them at Kroger every once in a while! Oooooh!!! That sounds great! I do something similar in my Chocolate Cherry Smoothie! I AM DOING ARBONNE SHAKES, COULD I USE THE VANILLA SHAKE MIX WITH THIS?? NOT SURE IF ANYONE HAS TRIED IT. No one has mentioned trying it with this, but I’d love to know how it goes if you give it a try!